George1 wrote: The fate of "Kerch" will be solved within three weeks. Kerch will for sure be taken out of service, now that the Grigorovich frigates comes into service. But i would expect several corvettes would be needed in BSF, 21631 Buyan-M perhaps. Then its time to think about a new flagship, the Slavas cant hold forever. There shouldn't be any Slavas in the Black Sea fleet anymore IMO. I'm surprised the Moskva is still there, figured it was fingered for the Northern/Pacific fleet - I suspect it still is in fact. A couple of the perspective destroyers would do nicely for the Black Sea/Mediterranean flotilla - ones with gas-turbine propulsion rather than the nuclear variants. A Slava in the mediterranean fleet can and is valuable, but its starting to get old and by 2020 the new destroyer could take over, but as you i also think it should be gas-turbine. Moskva can't be taken out of the BSF because without it they have essentially no useful major surface combatants. After 11356s start arriving, Moskva will be up for modernization/repair @ Zvedochka like Ustinov is right now- maybe when it emerges it can go to another fleet. No new destroyer will be ready for service by 2020, come on guys. Reality! One thing I am interested in is the Zaliv shipyard in Crimea-potentially one of the biggest catches that Russia jacked from Ukraine. They built the Sevmorput back in the day (the huge icebreaker/cargo ship), and have a very large dock and crane....they got an order for 4 military ships of an unidentified type recently. Probably something small like Byans, but if they do well, perhaps they could get a frigate or even destroyer order eventually. TR1 wrote: Kerch is done. TR1 wrote: No new destroyer will be ready for service by 2020, come on guys. Reality! Dont be so sure, the new Destroyer wouldnt be so different from a larger Gorshkov, much of new tech and weapons standard has already been done. About the Zaliv, it can build large tankers, but hasnt recently been building warships , so it would be some major investments before they can build modern Frigates or destroyers. Russia has plans to build nuclear powered and gas turbine versions of Leader class destroyer; a high-ranking source from the Russian Defense Ministry was cited as saying by Tass Today. “The technical design specification prepared by the Navy command has been signed by the Defense Ministry leadership that approved the engineering design for two versions of the destroyer — nuclear-powered and gas turbine. There are no specifics regarding the weapons, but the new ship will be most likely equipped with high precision cruise missile system and S-500 anti-aircraft defense system,” the source was quoted as saying. According to him, the Russian Navy is expected to place orders for 12 Leader class destroyers, 6 each for Northern Fleet and Pacific Fleet. Mediterranean and Black Sea probably doesn't need any ABM protection - but certainly a few S-300/S-400 class air-defense umbrellas for the Russian naval assets there. IMO the Shtil-1s of the Admiral Grigorovichs just don't quite cut it; even if compatible with the latest Buk-M3 missiles; that would still leave them with only 70km ranges. Not really enough for a naval group. The Redut VLSs of the Admiral Gorshkovs might though, they can carry the 9M96 ('small' S-400) missiles - the latest iterations of which have ranges of +120km. Of course it would be nice though if the Reduts would be compatible with some of the longer range S-400 missiles; but no doubt the 9M96s would be further developed anyway with increases in range and max. altitude. With that I'd be content - if Gorshkovs end up as the largest vessels serving in the BSF & Meditteranean fleets. The division of surface ships (the former 30th Division) was recreated at the Black Sea Fleet on the basis of a single brigade – of anti-submarine ships, a source in the power structures of the Crimea told RIA Novosti on Monday. The thirtieth Division of surface ships of the Black Sea Fleet was scaled down to one anti-submarine crew in the time of Russian Defense Minister Anatoly Serdyukov . Deputy Commander of the Black Sea Fleet, Vice-Admiral Valery Kulikov visited the revived division of surface ships of the Black Sea Fleet and presented its new commander – Captain 1st Rank Oleg Krivorog. Good news. Kerch will be scrapped. Its time for modern vessels. BSF takes into service second Varshavyanka class submarine, the Rostov-on Don. It will take northern deepwater trials and will sail internally to the Black Sea in the first half of 2015. The six Project 636.3 submarines should be brought into service by 2016 and will be based in Novorossiisk, where the RN is finalizing the construction of a complex basing system. The aviation units of Russia’s Black Sea Fleet Air Force, Air Defense and Naval aviation have received modernized attack aircraft and fighter jets, including Sukhoi Su-34 and Su-30M2 fighters, Mil Mi-28 attack helicopters and Mi-8MTPR electronic warfare helicopters. Russia’s Black Sea Fleet Air Force, Air Defense and Naval aviation units have received 10 new and modernized aircraft and helicopters, the press service of Russia’s Southern Military District reported on Friday. Among the new military hardware are Sukhoi Su-34 (NATO reporting name Fullback) twin-engine, two-seat strike fighters. Based on Sukhoi Su-27 'Flanker', the two-seat Su-34 is designed primarily for tactical deployment against ground and naval targets. Modernized, multipurpose Su-30M2 fighters are designed to gain air superiority by destroying manned and unmanned aircraft with medium- and short-range air-to-air guided missiles, engaging surface and ground targets with all kinds of weapons, primarily precision ones. The main features of Su-30M2 include a modified weapon control system cwith advanced capabilities of destroying ground and sea targets; a new cockpit display system with multifunctional color liquid crystal displays; improved navigation and radio communication systems; a modern onboard defense system; a wide range of “air-to-air” and “air-to-surface” weapons hosted on 12 hardpoints and an in-flight refueling system. The jet's strengthened airframe and landing gear ensure that it can operate with full fuel tanks and maximum combat load at take-off weigh up to 38 tons. The Su-30M2 weapon control system provides for the detection, tracking and destruction of air, ground and sea targets with aircraft weapons in all weather conditions, day and night. The Mil Mi-28 (NATO reporting name "Havoc") is an all-weather, day-night, military tandem, two-seat anti-armor attack helicopter. And Mi-8MTPR electronic warfare helicopters are designed to be able to detect and suppress electronic command-and-control systems as well as the radars of surface-to air and air-to-air missiles. All the hardware has been tested by the engineering and technical services of the manufacturers, the press services said. The units are now holding exercises, to improve the skills of handling and operating the new combat equipment. Over 50 more new and modernized aircraft and helicopters will be transferred to the aviation units of the military district in the near future. MOSCOW, July 23. /TASS/. The Project 11356 lead frigate Admiral Grigorovich is scheduled to join the Russian Black Sea Fleet and reach Sevastopol on the Crimean peninsula by the end of this year, Fleet Commander, Admiral Alexander Vitko said on Thursday. "This year, we expect the lead frigate Admiral Grigorovich to reach Sevastopol and the submarines Novorossiysk and Rostov-on-Don to arrive in Novorossiysk, the Black Sea Fleet commander said. The Project 11356 lead frigate Admiral Grigorovich is completing a cycle of trials and preparing for its passage to the Black Sea, the admiral said. The Russian Black Sea Fleet has completed forming crews for the Project 11356 frigates Admiral Grigorovich, Admiral Essen and Admiral Makarov, he added. "All the ships will be manned solely with contract personnel. All the above-mentioned warships will enter service in the squadron of surface ships that has been re-established in Sevastopol," the Black Sea Fleet commander said. The crews of the small missile-carrying ships Serpukhov and Zeleny Dol built for the Black Sea Fleet in the Volga Republic of Tatarstan have also been formed and started training. The Russian Black Sea Fleet has also completed the process of forming crews for the newest diesel-powered submarines Novorossiysk, Rostov-on-Don, Stary Oskol and Krasnodar, the admiral said. It was earlier reported that the first pair of the Project 11356 warships would be transferred to the Black Sea Fleet by the end of the year. "The Admiral Grigorovich and the Admiral Essen will be commissioned this year or at least this is what we expect. The former is undergoing trials and the latter is preparing for them. Meanwhile, the third admiral-series frigate will enter service next year," Igor Ponomaryov, head of the Yantar shipyard, which is building the frigates, said in June. Russian Deputy Defense Minister Yuri Borisov said on the Single Day of Military Products’ Acceptance on July 16 that the Yantar shipyard had disrupted the deadlines in 2014 for delivering the first Project 11356 frigate Admiral Grigorovich. The warship is expected to be commissioned in November 2015. George1 wrote: Good news. Kerch will be scrapped. Its time for modern vessels. Would have loved to see it preserved as a museum though. Νew navy base in Novorossiysk. 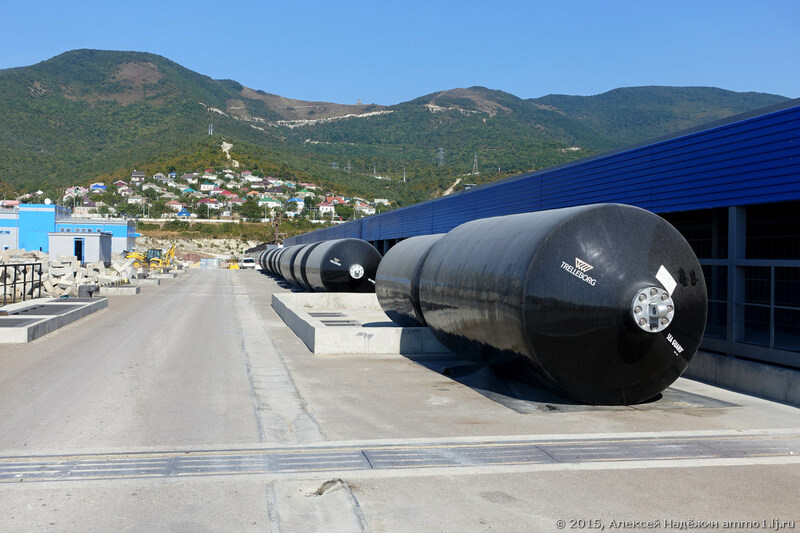 Very soon in Novorossiysk will go the first submarine. There is still a lot of work to do to build all needed infrastructure. Anyway, Black sea fleet will have two big bases and have a space to grow. I don't think they will have cruisers and destroyers, so they could well grow in the numbers of frigates and corvettes. 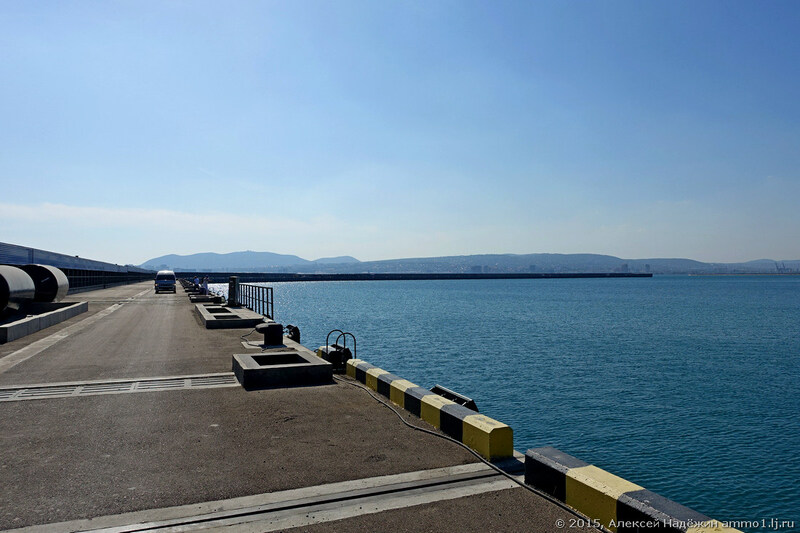 The Russian Defense Ministry is completing the construction of the final three submarine berths in the Black Sea port of Novorossiysk (930 miles south of Moscow). According to a RBTH source in the military-industrial complex, the Black Sea Fleet's new base will host six Varshavyanka class Project 636.6 submarines. "Currently, three of them are already in the city's harbor – the Rostov-on-Don, Novorossiysk and Stary Oskol," the source said. "Each submarine is equipped with underwater torpedoes to combat surface ships and Kalibr missiles, which have demonstrated their combat power in Syria, including the ability to hit targets at a distance of up to 2,500 km." "The deployment of Varshavyanka class Project 636.6) submarines in Novorossiysk allows Russia to control potential threats in Europe and the Middle East," said the source. 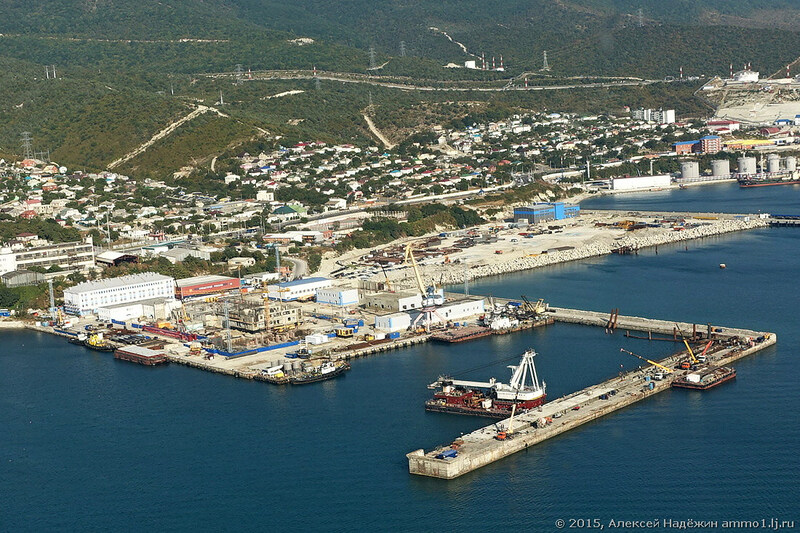 In the period since 1991, the naval base in Crimea was handed over to Moscow on a lease, but any fleet update (to the very last bullet) had to be coordinated with the parliament in Kiev. According to the TASS news agency's military expert Viktor Litovkin, Ukraine's policy after the collapse of the Soviet Union boiled down to squeezing Russia out of Crimea, but since the takeover of the peninsula by Moscow in 2014, the situation has changed and a full-scale reform of the fleet has begun. "Sevastopol Bay offers unique opportunities to Moscow," Litovkin said. "Together with the new base in Novorossiysk, Russia can fully control the Bosphorus, the military infrastructure in Bulgaria, as well as neutralizing the threat of a U.S. missile defense base in Romania." According to Alexander Khramchikhin, director of the Institute of Political and Military Analysis, a Moscow think tank, the key threat of the U.S. missile defense system in Eastern Europe to Russia is the ability to instantly convert a missile defense base into an offensive one. The strength of the new base's location for the Black Sea Fleet is the possibility to distribute ships and submarines between several naval bases in the same region, say analysts. 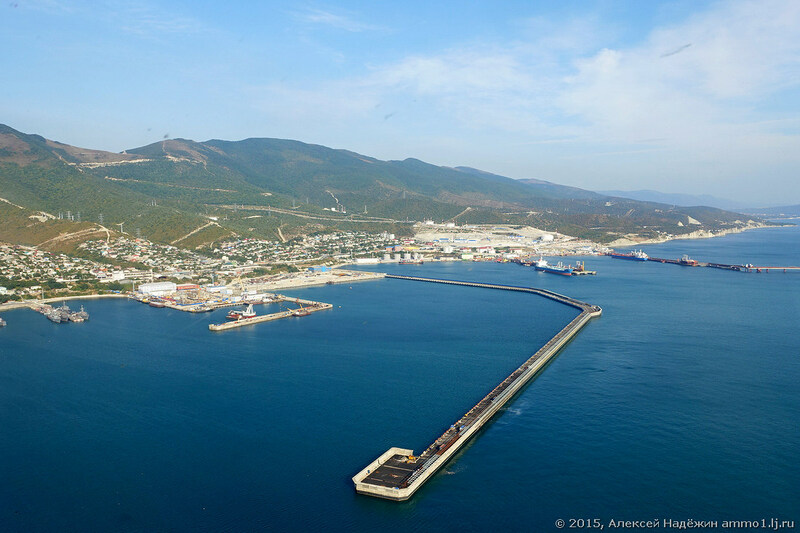 However, the base in Novorossiysk has a crucial issue that still needs to be resolved. "First of all, it's about climatic conditions," Litovkin told RBTH. "The maritime area of Novorossiysk is regularly subjected to the impact of northern winds from the Caucasus Mountains, which hit ships and houses in their path with great force. "The wind can throw ships ashore and destroy the entire military infrastructure. The base is being constructed in such a way that the gusts of wind will not be so catastrophic." According to him, Russia is building an additional tunnel in the Caucasus Mountains to nullify the threat of destructive winds. In April 2016, I published a short article in the Oxford Analytica Daily Brief discussing the role of Russia’s Black Sea Fleet post-Crimea annexation. Here’s the text, as usual with no edits other than restoring some cuts made for space reasons. SUBJECT: The growing power of the Russian navy in the Black Sea region. SIGNIFICANCE: Russia’s annexation of Crimea has reshaped the geopolitical environment in the Black Sea and its neighbourhood. New frigates and submarines are being acquired, and cruise missiles will provide a much extended range. With its strategic options no longer constrained by Ukrainian sovereignty over the Sevastopol base, Moscow can use naval and air forces to dominate the sea and create a forbidding environment for potential adversaries, including NATO. The deterioration in relations with Turkey could manifest itself in maritime tensions between the two states. Access to the Bosphorus may restrain both Russia and Turkey from encroaching on one another’s maritime rights despite hostile rhetoric. US and European militaries will review naval capacity and may reinforce Mediterranean patrols to counter the increased Russian presence. maintaining links with the Russian naval base at Tartus in Syria. The bulk of the fleet is based at Sevastopol in Crimea, as is its land-based air arm. 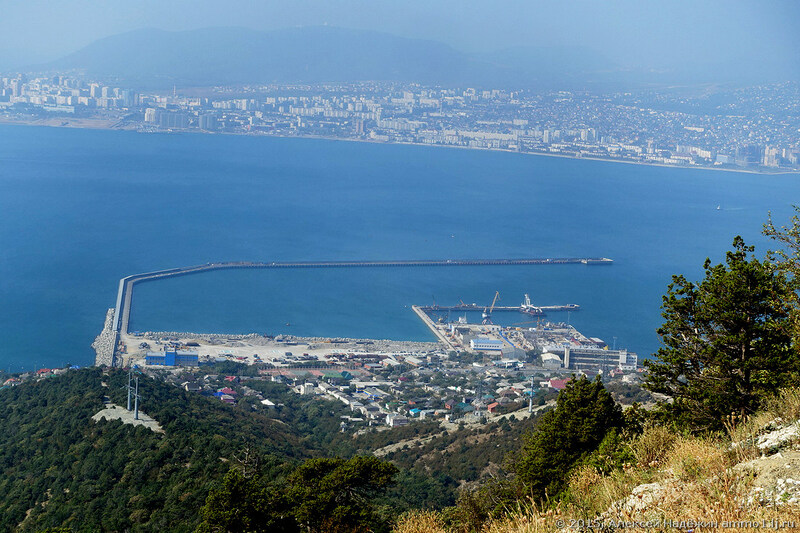 The Black Sea is of great economic significance to Russia, whose commercial ports — mainly Novorossiysk — carry 30% of its total maritime exports. For Russia, the sea is an access route to the Mediterranean and to the Atlantic and Indian oceans, and hence important for both economic and geopolitical reasons. The Black Sea Fleet is needed to underpin that access, as well as to deal with potential instability in the Caucasus. It provides logistical support to the Mediterranean squadron which was reconstituted in 2013. During its post-Soviet history, successive lease agreements of the Sevastopol naval base from the Ukrainian government stipulated that Russia could not base new ships in Crimea. This clause was intentional, designed for the fleet to rust away. By 2014, the Moskva cruiser was the only Black Sea Fleet surface ship able to operate out of area for extended periods of time. Even its basing arrangements in Ukraine were such that it had little need to defend the peninsula, since this was Ukrainian territory. Three of the frigates will be commissioned in 2016, while the others will take some years to complete because Ukrainian-made gas turbines are unavailable. Both the corvettes and two of the six submarines have been commissioned, with the remaining submarines to enter service within two years. The corvettes and submarines will carry the 3M-54 Klub anti-ship system, a supersonic cruise missile allowing the navy to deny access to much of the Black Sea. They will also be armed with the 3M-14 cruise missile designed to attack targets on land at ranges of up to 2,500 kilometres. The combination of coastal and air defences, maritime aviation and corvette-based groups will free the submarine and frigate force to operate in the Mediterranean. The Black Sea had been likely to receive one of the two French Mistral helicopter carrier/amphibious assault vessels that Russia ordered in 2010. Since France cancelled the sale in August 2015, there has been no announcement from Moscow about acquiring amphibious ships from elsewhere. Nor is it clear what will happen to the old Alligator- and Ropucha-class landing ships which were instrumental to the occupation of Crimea. Before Russia aircraft were deployed in Syria to bomb rebel forces, vessels from the fleet were playing a key role in the military supply operation known as the ‘Syrian express’. Initially, older landing ships were used to supply arms and equipment to the Syrian military. Once Russia decided to launch air attacks, the Black Sea Fleet provided the maritime transport. The conventional wisdom that Russia was incapable of conducting military operations beyond its immediate vicinity was confounded by the successful use of large transport aircraft, naval freighters and even Turkish commercial cargo ships reflagged as Black Sea Fleet vessels. The Russian navy provided long-range air defence with the S-300 missile system carried on the flagship Moskva in the first half of the operation. Having a ship-based, long-range air defence system allowed Russia to protect Syrian airspace while avoiding tensions with Israel, which had made it clear it would be unhappy if such weapons went to the Syrian army. In October 2015, the Russian navy launched 3M-14 cruise missiles against targets in Syria from relatively small vessels in the Caspian Sea. By launching missiles from the Caspian, Russia demonstrated its strike capacity from well inside its air defence perimeter. The cruise missiles were also meant to show NATO military planners and neighbouring states the successful development of a missile capability that would be difficult to neutralise. Once the Black Sea Fleet acquires vessels armed with 3M-14 cruise missiles, its range will extend to most of Southern and Central Europe and the Middle East. Russia’s demonstration of new naval strike capabilities continued in December 2015, when Kalibr cruise missiles were launched against targets from a new diesel-powered submarine which was transiting the Mediterranean en route to its permanent base at Sevastopol. This use of hard-to-track platforms further highlighted the threat to Russia’s potential opponents. Russia’s annexation of Crimea has remade the geopolitical environment in the Black Sea. Crimea’s geographic position allows the country that controls it to dominate the maritime environment. Sevastopol is by far the best harbor on the sea. By taking Crimea, Russia has ensured that its military will not be constrained by Ukraine. This will allow its navy and air force to dominate the Black Sea, creating a forbidding A2/AD environment that will be difficult for any potential adversary, including NATO, to penetrate. Given the adversarial nature of Russia’s relationship with the West, the Black Sea Fleet will take on additional missions beyond the Black Sea in the coming years. In addition to continuing to provide sealift for Russian operations in Syria, the BSF’s cruise-missile equipped ships and submarines will have a power projection role in the Mediterranean. Even with a fairly small number of frigates and diesel submarines, the fleet will present a potential threat to other naval forces in the region, even U.S. carrier strike groups. This does not mean that the Russian Navy should be expected to undertake aggressive actions in the Med. Rather, its objective will be to create conventional deterrence against a Western attack by threatening to use its air and sea capabilities to inflict unacceptably high casualties on enemy naval forces attempting to engage Russian forces in the Black Sea or eastern Mediterranean. CONCLUSION: In the context of Russia’s adversarial relationship with the West, the fleet is likely to be assigned tasks outside the Black Sea such as sustaining a capable naval force in the eastern Mediterranean and continuing to support the Russian military presence in Syria. The fleet will also deliver conventional deterrence through its implicit capacity to inflict unacceptably high casualties on potential adversaries in the Black Sea or the eastern Mediterranean. 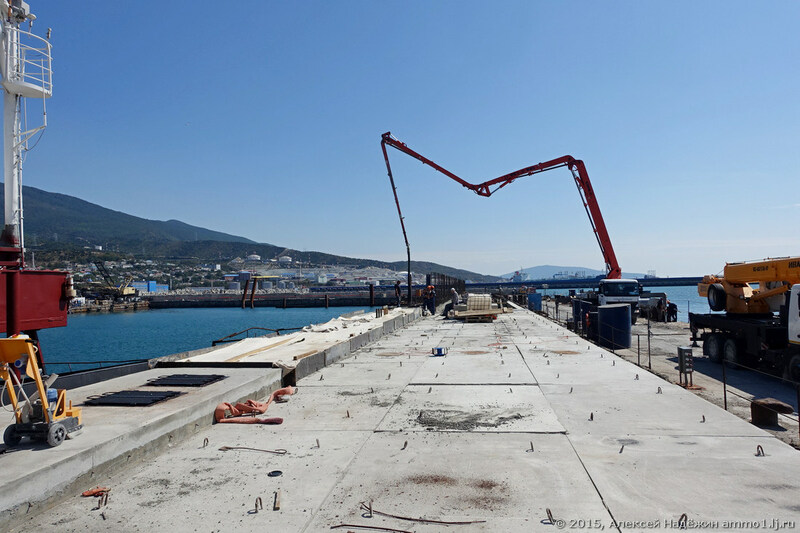 Construction of the Novorossiysk Naval Base. October 2018. 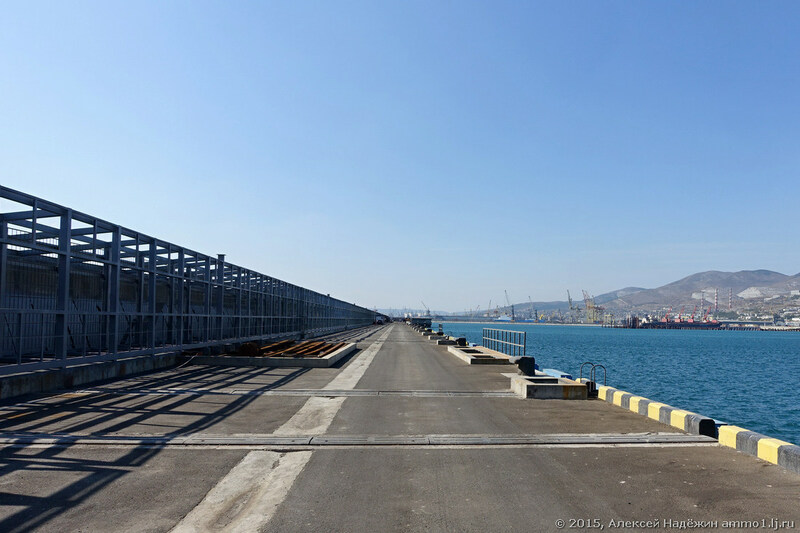 The construction of the Novorossiysk naval base continues. The moorage for submarines is being strengthened along the outer perimeter. Also, the work on the Western Mall continues...It is the secondary base of Russia's Black Sea Fleet after Sevastopol.